It is not usual for events to be named after players who are still competing at the top level. The Victor Champion Cup (which began in 1953 as a round robin of all teams eliminated before the finals of the Open and Women’s Interstate Teams) was an exception. Victor Champion (1908-1974) would captain a Victorian team at the Interstate, several times more with the last occasion being in 1961. The recognition given to ‘Champ’ reflected his dominance in Victorian and Australian bridge from the mid-1930s to the early 1950s, which saw the rise of NSW teams and pairs. Between 1934 and 1961 he was the captain of sixteen Victorian teams which won seven Australian championships. He was winning captain three times in a row in 1934 to 1936 – an achievement surpassed only by Bill Schaufelberger in 1947-50. ‘The excellence of Mr Champion’s team lay in the fact that their rate of error is much smaller than ours. Each player has confidence in the other; with the slightest encouragement they are hardly ever guilty of underbidding; alternatively, they did not overbid. There is no record of Victor having played competitive bridge before he left Melbourne for England. We also know little of what he did when he was living over there between 1927 and 1932. At some point, though, he became a bridge professional and was employed by the Knightsbridge Bridge Club in London. We first hear of him back in Australia from advertisements in The Argus in February 1931 informing the public that he had taken the position of instructor at the Kallara Bridge Club. The Kallara Club was a privately-owned business that opened in 1928 at 24 Park Street, South Yarra. It was to be Victor’s ‘home’ for the rest of the decade. For the rest of the decade, Kallara dominated the tough Melbourne pennant competition, missing out on the finals only once. Under Champ’s captaincy and tutelage, the club fielded formidable teams that also provided the basis for Victoria’s success in National Championships in this period. The 1935 Kallara team, for example, consisted of Champ, Norman Mussen, Al Goldberg and Hal Oddie. Champ attended the first meeting of the Australian Bridge Council in 1935 but was not generally an administrator or a person who could steer issues successfully through organisations. He did though get involved in any debate that was going about selection processes and preparations for interstate events. Even in an era when State rivalries were more real than they are now, there was nobody who cared as much about the interstate and Victoria’s prospects than Champ. This did not always produce positive outcomes. The History of Australian Bridge covers his role in the split in Victorian bridge in 1955. A precipitating factor (although not necessarily the major underlying cause) in the split was Champ’s wish to have sole selection rights – driven by his concerns that existing methods were not producing the best Victorian teams and to revive the pre-war glory days of Victorian bridge. This did not discourage him from continuing to raise the issue during the remainder of the 1950s and early 1960s but administration and managing organisational politics and consensus building was not his forte. Champ was also an important bidding theorist. In the early to late 1930s when Culbertson was totally dominant he favoured Sims in a somewhat adapted form. He flirted with Pachabo in the mid to late 1930s and then again in 1959-60 but during the 1940s developed the Champion system used by Victorian teams over a number of years. This essentially combined elements of the Sims system, particularly finding game values early, with Culbertson honour trick counts. The Champion system also included the 2NT as a game force and pivot bid and Victorian Blackwood which used 3NT in different situations as an Ace ask. The bridge columns authored by Champ show a very skilled writer focused on the overall strategy, psychology and ethics of the game. His output though was not great. 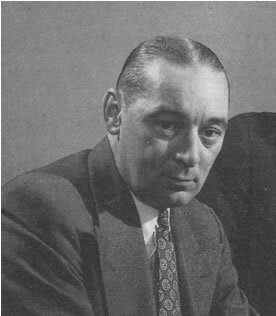 He wrote for the short-lived Australian Bridge Player during 1934-35 and contributed briefly a bridge column to the newly founded Woman’s World in 1937. He also briefly wrote a Bridge Notes column for the Melbourne Argus in 1941 but fell victim to wartime space restrictions. His articles have stood the test of time well. They are highly readable and notable for their psychological insight as well as knowledge of the game. His constant refrains were to work on the basics, to understand the broad strategies of the game and the overwhelming importance of ethics and good manners. Champ only narrowly managed to be born in Australia (in Windsor, Melbourne) – his parents having arrived in the country from the UK only a few months before. His mother was an actress, born Ethel Louise Naf, the daughter of a prominent Swiss linguist resident in London, who on stage was known as Dolly Champion. His father was a prominent English stage conductor, real name Victor Lonnen, stage name Victor Champion, born in Liverpool in 1866. Victor’s grandparents on his father’s side were journeyman actors following the theatre circuits in the UK until his grandfather settled in Liverpool to be stage manager of the main theatre in the city. The next generation though operated at a much higher level – and at very early ages. Champ’s father’s older brother was EJ ‘Teddy’ Lonnen (1864-1901). He was regarded from when still a teenager in the 1880s as one of the best, and in some respects the best of all, comedian/singers on the English stage. He performed throughout the English-speaking world, including Australia in 1882, where he generated a sheet music hit for a song he performed about a member of a Sydney street gang or ‘push’ and again in 1892. Teddy’s daughter, Jessie Lonnen, Victor’s cousin, also became a major star in the UK and in Australia. One of Teddy Lonnen’s well-known songs – ‘Hush hush, here comes the Bogey Man’ – provided the inspiration for the use of the term bogey in golf. Champ’s father studied music rather than acting. He began as a pianist but turned to conducting and, by the time he was 19 established himself as a leading conductor of both musical theatre and opera in the London and major provincial theatre scene. To avoid confusion with his well-known brother he took on the stage name of Champion used by his father. From that point, the name Lonnen was never used.At birth Victor Jr was registered as ‘Victor Melbourne Champion’. In 1886, aged 20, he had become famous by marrying Maude Branscombe, an English model who was the late nineteenth century’s equivalent of Marilyn Monroe. It was estimated that around 42,000 copies of her photograph were sold when she first came on the scene in 1878 and the photos were still in considerable demand in the mid-1890s. The relationship though did not last long and Maude’s life went into a downward spiral in the 1890s. Victor Sr came to Australia in 1908, when he was 42, initially on a temporary basis with a touring production but stayed on to do further productions for the theatre group, breaking prior commitments to perform in France in the process. When the English firm was absorbed by JC Williamson, he became their Director of Music. In following nineteen years until his death he enjoyed a stellar career as the musical force behind all the leading Williamsons productions, primarily in Melbourne and Sydney but also New Zealand. The regard in which he was held is indicated by the fact that he (with Dolly and Victor) spent the year of 1923 travelling through the US and the UK looking at the latest theatre trends for JC Williamson. 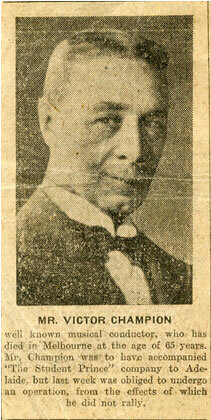 Victor Sr died in Sydney in 1928, following an emergency operation. For the first and last time his photograph appeared in the papers. Of Victor’s early life, we know that in 1917 he entered Scotch College in Melbourne. Except for a year overseas with his parents in 1923, he remained until he finished school in 1925. In his final years of school he was a boarder. Charles Hickman recalled that he trained as an accountant, most likely at the University of Melbourne where the new discipline had just been established. After that, of his life outside bridge, we know virtually nothing. Victor, like his father, was an intensely private man. None of his contemporaries claimed to have been close to him. He never married although was reported to have been engaged twice. He had extended family in Melbourne as his mother’s sister, Kate, had come out to Australia to be a governess for the prominent Melbourne jeweler, Andrew Drummond, and had subsequently married him. There were also descendants of his father’s uncle, Arthur Jesse Lonnen, a sea captain who had drowned in the sinking of his ship the Loch Finbar off the coast of Tasmania in 1908. There are no recollections though of his having made contact. His addresses in and around the Melbourne city centre tend to indicate that at best he only ever made a modest living from bridge. His finances were probably not helped by his aversion to publicity. There are only two known advertisements for his services – both in 1931 when he returned to Australia. When bridge life died temporarily at the beginning of the Second World War, he was employed by Bill Noall as his secretary. He never married although was said to have been engaged a couple of times. Charles Hickman recalled that Champ’s final years were marked by a series of ‘disappointments’ and ill-health, particularly emphysema , which eventually took him away in 1974. A fitting finale to his career would have been to be a member of the first Australian team at the first Bridge Olympiad in 1960. He was a first choice but could not afford to go and pride did not allow him to accept the help offered by several of his more affluent team-mates. There have been many equally good or better players since but fewer who have stood so far above their generation, have invested so much passion in their state team, and been so devoted to the future of the game. Champ’s death certificate was in many ways, with its series of inaccuracies about date of birth, parents, names and occupation, a tribute to his tenacity in keeping his privacy. Like his father though whose picture, despite his best efforts in life, finally appeared in the papers, the sheer scale of his achievements in Australia bridge make future obscurity very unlikely.